Add a hint of fruit or herbs to your beverage with this innovative slow-melting ice mold. Give water a refreshing burst of berries, bourbon an unexpected splash of lemon, or ginger beer the perfect twist of lime with this happy hour essential. 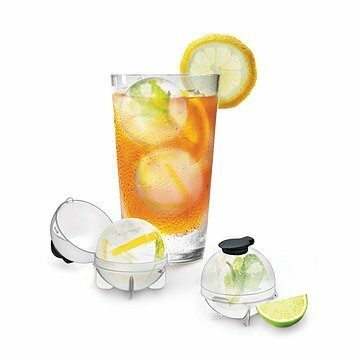 Simply open the ice mold sphere, add your choice of herbs or fruit, then close and fill with water through the flip top. Once frozen, the ice spheres will slowly melt to reveal the subtle scents and tastes of your drink's finishing touch. Made in China. Ice Ball tabs will vary in color. I definitely would buy this product again. It is so versatile for what drinks we like. Fruit in ice balls is the best. We've used a number of ice cube trays and freezing shapes over the years, and they are generally a pain to remove the ice. These worked great, the ice comes right out, and it's such a unique look to see giant floating balls of fruit in a drink. It adds a simple element of fun to a brunch drink. We loved these!! They were perfect and quite popular at our last party. We used lemon wedges and lime wedges and they really did work well with the Moscow mules we were serving!! Would definitely buy again...kept 2 sets for me and gave 1 set away. These are going to be used every day! And frozen fruit ice ball are so pretty!!! Great product! Great for flavoring water or tea. Very easy to use and store. I've added different fruit and used plain, the possibilities seem endless! Love that you can add fruit to the cube. We love to host! Great for specialty drinks or a great way to spice up a normal glass of water. Love these! Friends have a larger version for whiskey, but I bought these for that reason but also to serve with vodka or in iced tea and other non alcoholic beverages. Super easy to use and just a little lemon rind infuses so much flavor.